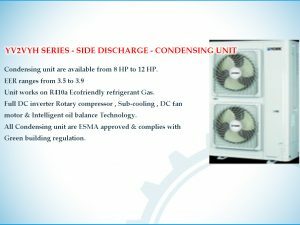 Condensing unit are available from 4 HP to 06 HP. EER ranges from 3.56 to 4.0 Unit works on R410a Ecofriendly refrigerant Gas. Full DC inverter Rotary compressor , Sub-cooling , DC fan motor , hydrophilic fin & Intelligent oil balance Technology. All Condensing unit are ESMA approved & complies with Green building regulation. 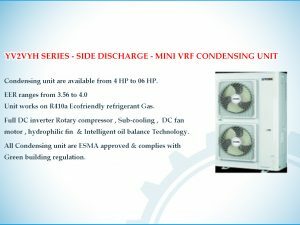 Condensing unit are available from 8 HP to 12 HP. EER ranges from 3.5 to 3.9 Unit works on R410a Ecofriendly refrigerant Gas. Full DC inverter Rotary compressor , Sub-cooling , DC fan motor & Intelligent oil balance Technology. 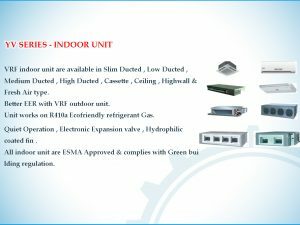 All Condensing unit are ESMA approved & complies with Green building regulation.